Do you know what it means to be “quanked?” I know. It’s sounds dirty, but I assure you it’s not! Do you know what a “minnock” is? How about “epistemophilia?” (And no, it’s not an exotic disease!) Well, on this week’s show we’re going to have not one, not two, but THREE vocabulary lessons. We’re also going to make up and see what we can hear. 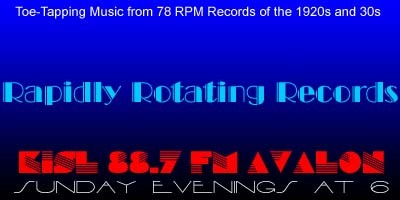 And, more than one of the records on tonight’s show is making it’s Rapidly Rotating Records debut. We’re also proud and happy to now be rebroadcast over Global Community Radio! We’re on GCR’s music channel GRC-2 and can be heard on the University of Wisconsin’s station WRST-FM 90.3 in Oshkosh at www.wrst.org Saturday mornings at 8 AM (Eastern). You can find out more about Global Community Radio at globalcommunityradio.blogspot.com. So Tired – Max Fisher California Orchestra / Johnny Murray, v.
Too Tired – Fats Waller and His Rhythm / Fats Waller, v.
Sweetheart Darlin’ – Adrian Schubert AHO / Elmer Feldkamp, v.
I Hear A Dream – Joe Sudy AHO / Joe Sudy, v.
I Hear A Rhapsody – Al Donahue AHO / Phil Brito, v.
I Hear Bluebirds – Hal Kemp AHO / Janet Blair, v.
Do I Hear You Saying “I Love You?” – Musical Comedy Orchestra (Selvin’s Orchestra) / Robert Wood (Irving Kaufman), v.
Let’s Make Up – George Olsen and His Music / Fran Frey – Bob Borger, v.
Love Divided By Two – Carroll Gibbons and The Savoy Hotel Orpheans / Harry Bentley, v.
Don’t You Wanna Know? – Ross Deluxe Syncopators / Margaret Miller, v.